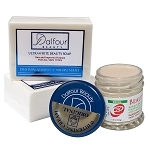 Premium Maximum Whitening/Peeling Soap - It nourishes your skin to let its natural beauty shine through! It also removes the appearance of skin blemishes and begins whitening your skin in just one week! Ultra-strong formula may not be suitable for sensitive skin. Relumins Advance White Stem Cell Therapy Intensive Repair Serum - Designed to hydrate skin and help you achieve a healthy even glow. The first whitening, hydrating serum to combine Placental Protein and TA Stem Cell so skin not only feels and looks younger and healthier, it actually is. 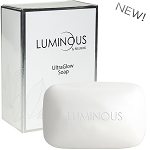 The active ingredients have exfoliating and whitening benefits. 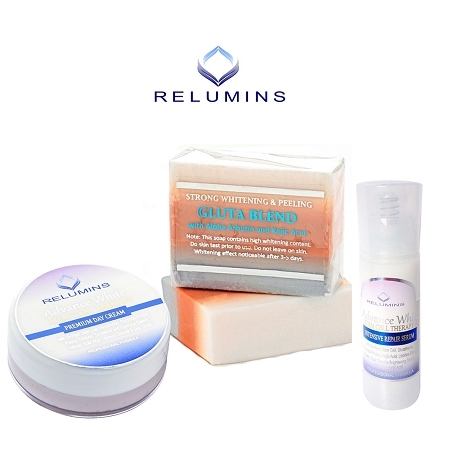 Relumins Advance Whitening Facial Cream - Designed to whiten skin and help you achieve a healthy even glow. The first whitening cream to combine Placental Protein and TA Stem Cell. The active ingredients are cradled in a light gel-cream base designed to hydrate and be absorbed deep into the skin where they can do the most to stimulate healthy skin repair, breakdown dark pigments and prevent new pigment formation. Purified Water, Coconut Oil, Grapeseed Oil, Glutathione, Kojic Acid, Arbutin, Ascorbic Acid, Titanium Dioxide, Iron Oxide, D&C Violet No. I have been using this set for almost 2 months now. Unfortunately, I haven't seen any slight improvement on my skin. It actually made my skin discoloration worse than before. Disappointed, I will not re-order this product. 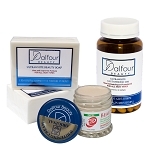 I was advised to use this suite of products by Suzzy to treat sun damage & dark spots on my face and chest. The results are excellent, for the last 6 weeks I see improvement every week. THe texture is better, the skin is more evenly toned and I feel more confident. Thank you so much for this small miracle.